If you are a smart home enthusiast, you will agree that a thermal camera is as essential as a flashlight or tape measure. In fact, a thermal imaging camera is more valuable since it can help you save a lot of money that you would otherwise spend on repairs. FLIR is by far one of the top manufacturers of thermal imaging camera globally. Also known as FLIR systems, this manufacturer has been in the business of creating thermal imaging solution for over 50 years. The company boasts of being the world’s sixth sense with its innovative technologies in the making of thermal imaging infrared cameras. One of their most popular and most affordable thermal imaging cameras is the FLIR One Pro. It is an update of the FLIR One with improvements such as the VividIR image processing technology that enables you to see components with full details even from a far distance. Right out of the box, the FLIR One Pro is pretty easy to set up whether you are using the IOS or the Android version. Most of the instructions are online and although a good number of accessories are still using the micro USB port, the FLIR One Pro is all in on the new USB Type–C. This is actually a good thing if you are looking to flip the camera in any direction with your android phone. The FLIR One Pro comes with FLIR's MSX technology that is great for enhancing image details. This thermal imaging camera is capable of sharp imaging performance that makes it a reliable tool for professional plumbers. The VividLR image processing it has gives your clarity even with small components that are far away. The FLIR One Pro is rugged and durable enough even for harsh environments. It can survive a drop of about 5.9 inches plus it comes with a tough build quality and a protective case. Thanks to the upgraded FLIR ONE App, you don’t have to deal with messy setups with the FLIR One Pro. All you have to do is sign in to verify and enable your warranty registration and the FLIR One Pro will be compatible right from the start. In fact, you can even report on your findings from your smartphone which is awesome. That’s right, with the FLIR One Pro, you can measure expanded temperature ranges between -4 and 7520F. This thermal imaging camera gives you up to 6 temperature regions of interest with 3 spot temperature meters that add to the image analysis for detailed reporting on your findings. 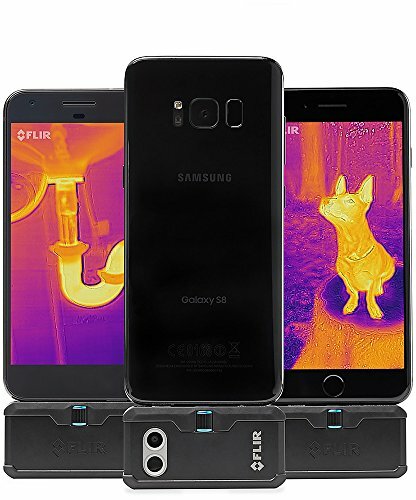 Since the FLIR One Pro is a self-contained dongle, it comes with its own batteries so you won't have to worry about draining your Smartphone's battery. The app is compatible with most modern Android phones as well IOS devices. The only exception is that most users complain that the dongle is incompatible with most Samsung devices even with a USB-C adapter. 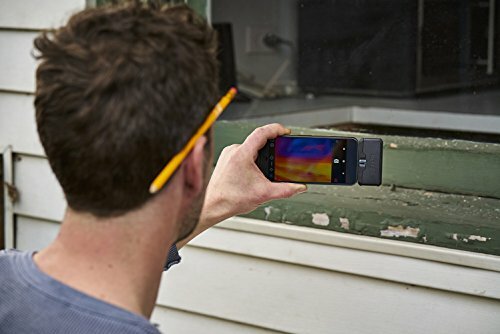 The android app on the FLIR One Pro is somewhat sluggish and even though FLIR claims that the camera and the app work seamlessly, you might have to restart the app once or twice for it to recognize the camera. The good part is that the app has an intuitive menu with enough tools on the viewfinder for various applications. The app is great for recording videos, images and time-lapse sequences. There are many ways to put the FLIR One Pro to good use. First of all, in terms of performance, the FLIR One Pro produces an image sharp enough to point out heat signatures. For those that love camping out in the woods, this thermal imaging camera is ideal for checking what’s lurking in the woods without any source of light. A camera is an essential tool for professionals as well as regular people who love to handle the mechanical side of any task at home. However, if you are going to rely on its batteries, you will have to compromise a bit as the batteries only last about 45 minutes unlike the 1 hour as claimed by FLIR. Furthermore, the battery takes time to get to full charge which can be an inconvenience for off-grid applications. Furthermore, the app is not compatible with Google Pixel 2 XL, the Nokia 8, Samsung S9 and S8, the Sony XZ, Xiaomi Mi and the OnePlus 5T. 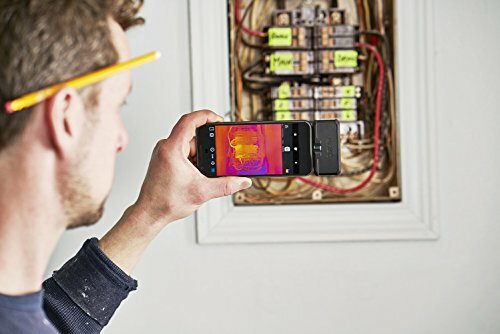 Compared to the FLIR One, the FLIR One Pro features a couple of advancements and improvements that most professional repairmen and contractors will love. For home users who are looking to come up with infrared movies at home or simply check their plumbing and other home appliances for faults, the FLIR One makes a decent pick. Not only is it a cheaper option, but it also works seamlessly with the downloadable android and IOS app. It has a dual camera that make thermal imaging more precise with an option for storing the images on the FLIR One's library on the dongle. One of the main differences between the Flir One and the Flir One Pro is the resolution of the images. The Flir One Pro has a better image resolution with a capacity to read the temperature in multiple locations or even flip over to a low gain mode. In fact, with the FLIR One Pro, you can read temperatures as high as 7520F. Additionally, the Pro camera comes with better image processing for clearer images with more details on thermal differences. Thermal imaging is known to be a domain reserved for professional technicians in big factories or electrical consultants. However, with the FLIR One Pro, everything changes and plumbers, home inspectors as well as smart home enthusiasts have equal access to an affordable and intuitive dongle for thermal imaging. In fact, the FLIR One Pro is an attractive option to most casual tech enthusiasts looking for a tool with various applications at home. On the other hand, professionals get access to an affordable accessory that they can use to achieve accurate and precise thermal imaging anywhere. If you are only looking for a cheap thermal imaging camera for home use, we suggest going with the FLIR One. Even though it has some issues, it is a much better value for the money for lightweight tasks. If you don's mind spending a little more money and want higher resolution images the FLIR One Pro is the way to go.